Long, short, business at the front, party at the back – it seems that just about every hairstyle in the fashion directory is on speed dial. But for the regular man, all these hair dilemmas of what’s in and what’s not can be as insignificant as the misplaced hair on aisle 32. But trendsetter or not, having an effective and consistent haircare routine will make all the difference in the way you look, and more importantly - how you feel. So what are some helpful tips to get rid of those hair-raising problems? Find out below! To have a healthy set of locks, you need to start by having a clean scalp. In order to achieve this, you need to exfoliate your scalp once or twice a week to eliminate dead skin cells and other unwanted dirt. A simple brown sugar exfoliating scrub mixed in with one to two tablespoons of quality hair conditioner will provide a thorough, but non-aggressive cleanse. Handy Hint: Towel drying can be one of the main culprits for damaged hair because of the powerful force implemented in the process of drying. After your shower, gently pat sections of your hair as opposed to a forceful rub. This will maintain natural oils and reduce the risk of damaging your locks. The regular man probably spends a good 10 minutes (maximum) getting dressed and ready for work. For this, he requires the correct tools to do the job properly. These essential hair gadgets include a brush with natural bristles and comb– select a wide-toothed comb if you have curly hair. To use these brushes properly, comb through the natural direction of your hair line as this will create the best possible look and style. Handy Hint: Never brush or comb your hair while it’s wet. Although it may get the job done quicker, doing so can damage your hair! If you intend on using hair-dryers and straighteners, be sure to spray your hair with heat-resistant products to avoid dehydration and damage to the hair and scalp. Getting the right haircut for the shape of your face is like finding a perfectly tailored suit; it makes you feel confident and stylish. But finding the right barber to style your hair? Ah, that could be a hit and miss. Nevertheless, you should also know the different styles and trims that suit your face. 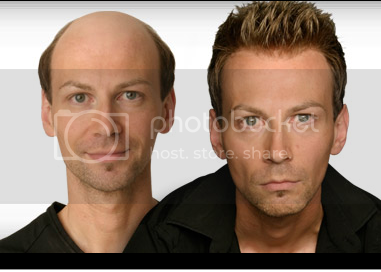 For men with naturally short hair, a quick trim at the top with a blended shave on the sides can sculpt any sized face. However, if you’re looking to really accentuate your hair and give it a fuller, healthier look, visit Transitions Hair or more information. Don’t Go Overboard on The Products! It’s so easy to overdo it on the products, isn’t it? However, applying too much gel or hair wax through your hair can damage stored nutrients and oil. If you’re looking to style up your do, there are natural and organic haircare and styling products to spike, comb and groom your hair. Fancy the timeless Don Draper look, or something a bit more edgy like Zac Efron? Don’t over saturate your hair with products! Use the natural parting of your hair as a guideline to structure and manipulate your hair. Implementing an effective hair care routine can give you the confidence and healthy lifestyle you’ve always wanted. Do you have any other handy hints? Comment below!